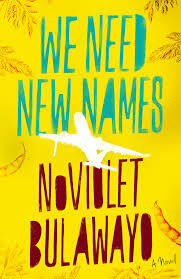 NoViolet Bulawayo’s debut novel, We Need New Names, was shortlisted for the Man Booker prize. NoViolet Bulawayo’s novel We Need New Names contains many rich, complex portraits of her native Zimbabwe, and one of the many things she does well is reveal imbalances of power. A terrific example can be found in this excerpt, “Blak Power,” published at Guernica, where you can read it now. The novel takes place in Zimbabwe during the land redistribution of the 1980s, after the transition to a government led by black, not white, leaders. The excerpt opens with an encounter between some kids, who are picking guavas from a rich neighborhood, and the guard, who has been hired to watch over the gate to one of the houses. The dialogue is funny and menacing. If you haven’t read the excerpt yet—or the novel—these pages of dialogue are worth the time by themselves. Already, even though we know very little about the guard or even the kids, we sense the tone of the encounter. A guard ought to convey a sense of authority and power, but the kids are curious more than anything else. They approach him in the spirit of play (“we’re not sure what to do with him”), almost like he’s a caterpillar or some other amusement they’ve happened upon. We’re right there with him but he is busy shouting like we are on Mount Everest. He looks us over with his dirty eyes, and we look him back, not answering, just watching him to see what he is all about. I can’t figure out if he is frowning or it’s his general ugliness. He is tall and his navy uniform looks like it’s just been slapped on him. On his left arm is a discolored white patch with a picture of a gun and the word Security embossed in red letters, and on his breast is a ZCC church badge. The trousers barely reach the ankles, and his boots are unpolished. He is wearing a black woolen hat and matching gloves, never mind the heat. Everything about him looks like a joke and we know he is a waste of time—if we weren’t this close we’d probably call him names and laugh and throw stones. Imagine how differently the guard might have been described by someone impressed by or intimidated by his power. For instance, the badge with the picture of a gun might have seemed frightening rather than shabby. But because the kids are not afraid of the guard—because the power imbalance actually runs the other direction, with the kids possessing more than the guard—details that, from the guard’s point of view, are supposed to seem intimidating, are, instead, comical. By the time the narrator says that they’d “probably call him names and laugh and throw stones,” we already understand the power dynamic. Choose two characters from any story or vignette you’ve written (or are writing). It doesn’t matter which characters so long as they have an opportunity to interact with each other. Figure out the power balance. There isn’t an interaction that happens anywhere on Earth that doesn’t have some sort of power balance. Even conversations between friends are charged: who gets the last word? Who picks up the tab? Who determines where to meet, when to leave, or what to talk about? When a disagreement is broached, who politely keeps their mouth shut? Who doesn’t? If a character says something stupid, does the other one call him/her on it? The important thing is to think of power in terms of agency, not force. It’s not a question of one character forcing another to act but, rather, one character being more able to fully inhabit his or her agency. The character with less power censors him/herself or waits for permission or instructions before acting. Choose one character as a lens to view the other. It doesn’t matter if you choose the more or less powerful character. The key is to pick one. You’re trying to write a description that is conscious of the power imbalance. Describe the other character, charging each detail. The easiest way to do this is to use the phrase “looks like.” Bulawayo uses the phrase when she writes that the guard’s “navy uniform looks like it’s just been slapped on him.” The charge can also be more subtle. In the next sentence, Bulawayo writes, “On his left arm is a discolored white patch with a picture of a gun and the word Security embossed in red letters.” She could have focused on the gun, but she leads with the word “discolored.” As a result, everything that follows is less impressive. We make judgments like this every day. Someone will say, “Isn’t he great?” And we’ll respond, “Yes, but did you notice…” You might even look back at descriptions you’ve already written. What adjective (like “discolored”) could you add to convey the attitude of the character doing the describing? The power imbalance doesn’t need to be gaping. Even the slightest imbalance can cause an otherwise uncharged scene to become much more interesting.